The North American Mycological Association is uniquely positioned to make a signature contribution to the field of mycology. 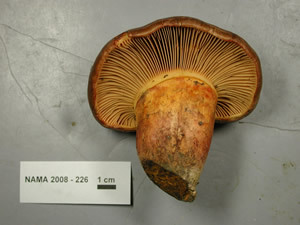 As an organization spanning an entire continent, NAMA can offer the scientific community thousands of specimens of a wide range of fungi collected from regions and habitats of North America from the forests of the Appalachians, Rocky Mountains, and Pacific coast, to the boreal forests of Canada, the Midwest oak woodlands, and the Gulf Coast. Every year for several days, scores of NAMA members collect hundreds of fungi from varied habitats surrounding the annual foray site. One collection – a voucher specimen – of each species identified by an expert, is photographed, recorded, and after being displayed, is dried for preservation. These vouchers are then accessioned into the herbarium of the Field Museum of Natural History, the repository of NAMA’s voucher specimens representing several thousand fungal species. DNA sequencing is proceeding with many voucher specimens. At each foray the display tables are laden with the hundreds of sorted, identified, and labeled species. Prior to the initiation of the voucher program, most specimens were discarded at the end of the weekend, while some were saved by interested mycologists. 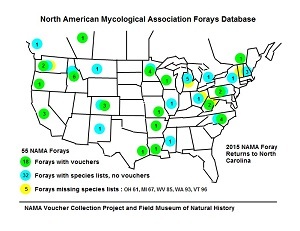 The NAMA foray lists, going back to 1962, are an indication of the variety of North American fungi, but no verification of the species or scientific research of material is possible unless collections are preserved. The Voucher Committee compiled the species lists from the past NAMA forays (1961 to 1996). The Voucher Collection Project started with the Colorado Foray in 1997. 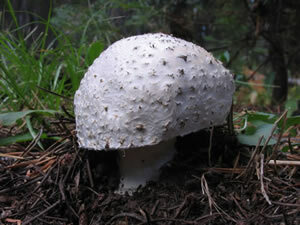 Every year, during NAMA's enhanced version of a "mycoblitz", 300 to 500 species are identified. 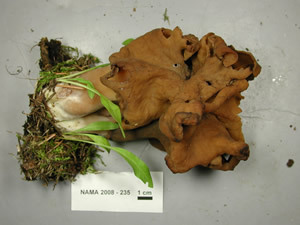 The NAMA foray database now lists over 3,000 fungus names. About 30 to 45 species are added to the list each year. There are many familiar species, such as Pluteus cervinus, that have been found nearly every year, but also many rare species. There are even species new to science, such as Russula avellaneiceps Fatto 1999 (from the 1997 Colorado foray). This program plays an important role in fulfilling NAMA’s mission to further the scientific study of fungi. These specimens serve as reference collections for the species identified at forays across the continent. No longer just names on a list, these species are represented by vouchers that can then be used by researchers. Systematic studies and monographs rely on morphology (physical features) and molecular data (DNA) provided by collections. We are building a permanent collection that will become a great representation of North American macrofungi, available to researchers worldwide. One of the most important steps in the process is for the collector to fill out a legible field label (collection slip) for each mushroom collection, including the foray number or detailed location, with habitat, substrate, collector's name, and date. 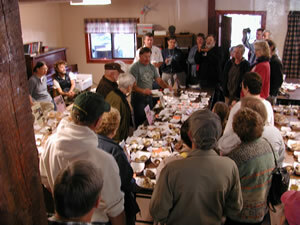 Most participants place specimens, with the completed field labels, on the incoming sorting tables. Many of these finds will be identified and appear on the display tables during the foray. A large number of the collected specimens (200 to 500) will be databased, photographed, dried, and added to the permanent NAMA collection. The specific goal of this program is to document each species identified at the foray with a single voucher specimen (which, of course, may include several fruiting bodies). Specimens are selected as vouchers based on the condition of the specimen, whether it is new to the current foray, and whether a voucher has already been made. 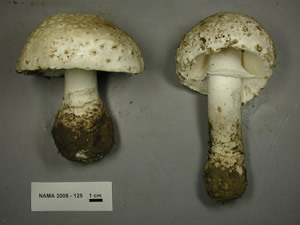 After being identified or verified by a mycologist, the data for the collection are entered into the foray database, a photograph is taken, then the specimen is usually placed on the display tables. Later, these voucher specimens are dried and bagged for shipping to The Field Museum. Every effort is made to display collections of rare specimens prior to their preservation as vouchers. Individuals with special interest in particular collections that they did not collect should make a request to the Voucher Program staff. Usually provision can be made to split specimens for sharing with interested parties. Specimens may also be sent on loan. If you have any questions, feel free to contact us. 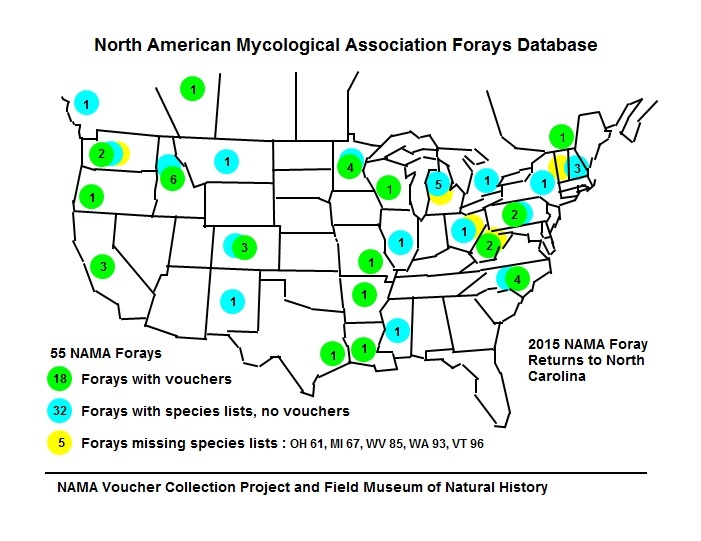 We are indebted to all the NAMA foray participants, volunteers, mycologists, and students who contribute their time and talent—and fungal finds—toward making the Voucher Collection Program a success.